Despite the fact that the offering appeared to be well oversubscribed at $72, it is important to note that the initially targeted range prior to the company’s IPO roadshow a few weeks ago was $62 to $68. IPO underwriters are usually the scapegoat when a stock has a material move in the days/ weeks after an IPO, they either left too much on the table for the company and priced the deal too low, or left investors holding the bag, benefitting the company if the stock were too fall too much pricing it too high. The simple fact of the matter is from my experience is that the underwriters have little to gain during pricing from putting too much money in the company’s pockets or vice versa for public investors, Their fees are fixed, knowing that they will always have one party they serve annoyed with them. All that said, LYFT raised $2.4 billion on the deal, giving the company a $20 billion market cap, nine months after the company’s last private fundraising round in June 2018 when the company was valued at $15 billion. 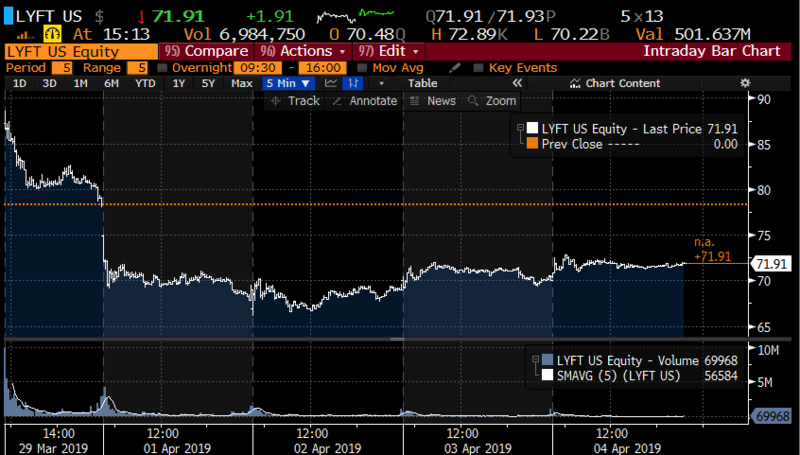 I have no position in $LYFT, but I find it interesting that its post-IPO drop largely blamed on valuation concerns/losses/competition. LYFT expected to lose $1.1 Bil (GAAP) on $3.5 Bil expected sales in 2019 +60% vs 2018 which was +100%, with a $20 Bil mkt cap trades ~5.7x sales. Again, I have no position in the stock but when you consider the massive backlog of mega-unicorn IPOs to come, all with eye-popping valuations, most with steep losses and no clear path to profitability any time soon while facing stiff competition from incumbents and upstarts is likely to be a market narrative for as long as we are in bull-market mode. Switching gears a bit to the options market… options on LYFT were listed today and as I write at 3pm 42,000 contracts have traded, with calls outpacing puts 2 to 1. Given the expensive borrow to short shares, much of this volume appears to be non-directional in an attempt to capture inflated put prices due to the high cost of borrow (read here for an explainer). With the stock at $71.90, the April 12th (next Friday) weekly 72 straddle (call premium + put premium) is offered at about $4.30, if you bought that and thus the implied movement in the stock between now and next Friday you would need a rally above $76.30 or a decline below $67.70 to make money, or about 6% in either direction. The next major catalysts for the stock, aside from other high profile IPOs from mega-unicorns Pinterest and Uber in the coming weeks will be underwriters initiating research coverage 25 days after the March 28th IPO pricing and then the company’s first earnings report which should come in mid-May. The listing of options right as volume appears to be declining from the frenzy of post IPO trading might serve to help dampen volatility, giving investors looking to hedge more options than merely shorting stock that might be locked up. I will add one last point, since the 32.5 million share ipo, 130 million shares have traded, with Virtu, the high-frequency trading shop topping the list of brokerage houses, suggesting much of this trading is not likely the result of a fundamental inclination, but possibly just the shiny new illiquid thing to trade.